Recent Yacht Design projects include a 60-foot powerboat optimized for day trips and short cruises. She is fast and efficient due to her very narrow beam and light weight. With jet drives, her draft is only 2'. She was built by Eric Goetz Custom Boats and launched in July, 2000. Top speed is over 35 knots and she cruises at 30 knots. 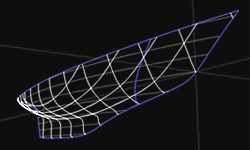 A significant Naval Architectural Service project was the computer modeling of the hull lines for Borkumriff IV, a 50 -Meter schooner currently under construction at Royal Huisman Shipyard in Holland. 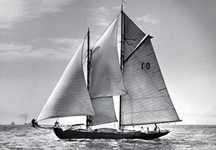 She is a traditional gaff rigged design with Naval Architecture by John G. Alden N.A. and Gerard Dijkstra and interior styling by John Munford. 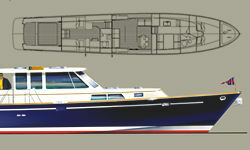 Additional projects included computer lofting of hulls, decks, keels, and rudder for Jim Taylor Yacht Design and others. Technology has played a central role in the early and ongoing success of the office. Our firm has been involved with three major tank-testing programs and several smaller series, testing more than fifty models in all. 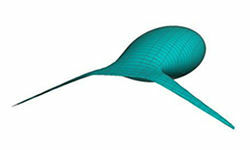 We make extensive use of computer aided design tools including: MultiSurf, Rhino3D, AutoCAD, and Velocity Prediction programs from AeroHydro and US Sailing. Although the office is technology focused, we recognize that new high tech approaches are not always best. Traditional design solutions are often both visually satisfying and very functional. The best classic designs represent a refined distillation of decades of practical experience and tradition. Edmonds Design has benefited from a long and ongoing working relationship with the John G. Alden Naval Architects office in Boston, which has been in business since 1909. Recent projects related to classic Alden designs include computer lofting of Design 390 (designed in 1929) for new construction and data base design for an ongoing project to scan and log more than 10,000 drawings going back to 1909. Copyright © 2003 Edmonds Design, Inc. All rights reserved.